Fully implemented, configured and working Windows Remote Desktop Services Host with Published RemoteApp functionality enabled. You will need access to the host to install our XTAM Auto Shell program and to make it a Published RemoteApp Program. Updated instance of Xton Access Manager with a System Administrator login. Login to your Windows Remote Desktop Services host. 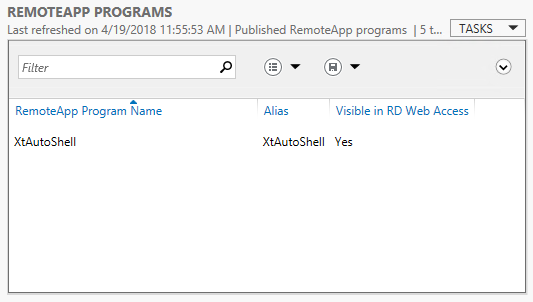 Publish XtAutoShell.exe as a new RemoteApp Program with the exact program name and alias XtAutoShell. Ensure User Assignment is properly configured for the published XtAutoShell RemoteApp. To modify User Assignment, right click on XtAutoShell and choose Edit Properties. Enable Remote Desktop to this host and enable permissions for the user account that you intend to define in your XTAM record. Login to XTAM as a System Administrator. Navigate to Administration > Record Types. Locate the Record Type Remote App Host and click its Edit button. Uncheck the option Hidden and then click Save. Return to the Record Types page and repeat this process for the Record Type MS SQL Studio. This record will create the secure, remote connection to your Windows Remote Desktop Services server host. Navigate to Records > All Records and (optionally) create a new folder. Create a new Record using the type Remote App Host. Enter a Name and Description. Host: Enter the host name for the remote desktop connection to your Windows Remote Desktop Services server. Port: Enter the port number for the remote desktop connection to your Windows Remote Desktop Services server. User: Enter the user account that will establish the remote desktop connection and launch the published XTAM Auto Shell program. Password: Enter the password for this user account. Filter: Enter the value MS SQL Studio. This defines which remote applications can be launched with the Remote App Host record. Empty value will permit any applications to be used. Remote App Platform: Select Windows RDS from the dropdown menu. Enabled: Check this box to enable this host for connection. This record will be used by the XTAM users to securely launch your MS SQL Server Management Studio remote application. Create a new Record using the type MS SQL Studio. Host: Enter the server name for your MS SQL Database connection. User: Enter the user account for your MS SQL Database connection. Open the MS SQL Studio record that was created in the previous step. Select the Connect and Record option to establish the connection with session recording enabled. A new session will open. It will first establish a secure connection to your Remote App Host server and then it will launch the XTAM Auto Shell script. Now, the XTAM Auto Shell program will launch MS SQL Server Management Studio, populate the Server name, User and Password parameters automatically and open the database connection. Once the connection is made, keyboard and mouse controls will be returned to you. Navigate through your MS SQL database and execute a few test SQL commands. Once satisfied, you may exit MS SQL Server Management Studio and then disconnect the secure remote session by closing this browser tab or window. At this point, you may review the video and keystroke recordings by opening the Sessions tab for this record. This completes the XTAM Remote App Launcher walkthrough. For additional remote app topics and how-to guides, return to the Remote App Launcher main page and use the topics listed at the bottom to navigate the available articles. Copyright © 2019 Xton Technologies, LLC. All rights reserved.